Started from Harbour Inn pub, nr. beach carpark at Ludden. Walk a few hundred yds along Tank road and up Hillview. Over gate at the end of Hillview and then follow track upwards through field. Track gradually disappears, but carry on pretty much straight up for direct route to highest point. Can get quite steep at times but not dangerous. 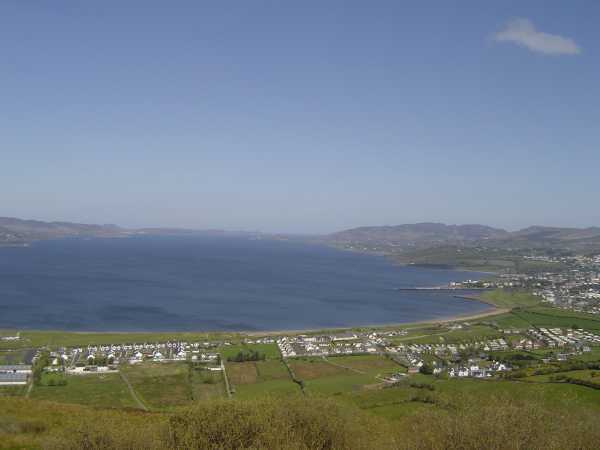 Fabulous views of Lough Swilly during ascent. From the summit can see up to the atlantic and down to Letterkenny, with Muckish and Errigal also clearly visible.